The red rock cliffs shelter the town of Agay on the Riviera, Cote d'Azur in Provence, France, Europe. The lovely little town of Agay on the Riviera along the Cote d'Azur in Provence, France is situated amid the Esterel Mountains well known for the unusual red rock cliffs and rocks. 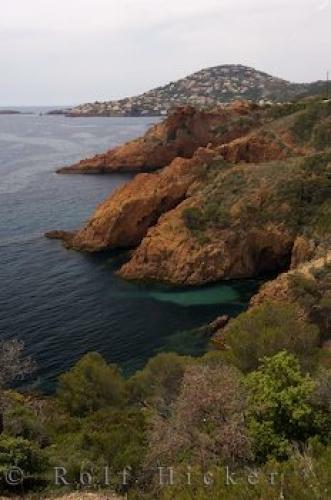 Behind Agay is the Foret d'Esterel, a 100 square kilometer forest.The town of Agay in Provence, France, nestles in a bay on the Mediterranean Sea. The two long sandy beaches and warm Riviera climate lures visitors from the rest of Europe. There are hotels, camping grounds, stores and an outdoor weekly market. About 20 kilometers from Cannes and 10 kilometers from Sant Raphael it is a quiet haven to stay, and yet is close to the larger and busier towns on the Riviera. This Cote d'Azur town of Agay was originally named by the Greeks around 500BC - 'Agathon Portus' means 'good port'- an unusual joining of Greek and Roman words.Town of Agay along the Riviera, Cote d'Azur, Provence, France, Europe. on Cote d'Azur in Provence, France.